Did you miss out on the Florida State Fair’s Cracker Country display this year? No Worries! 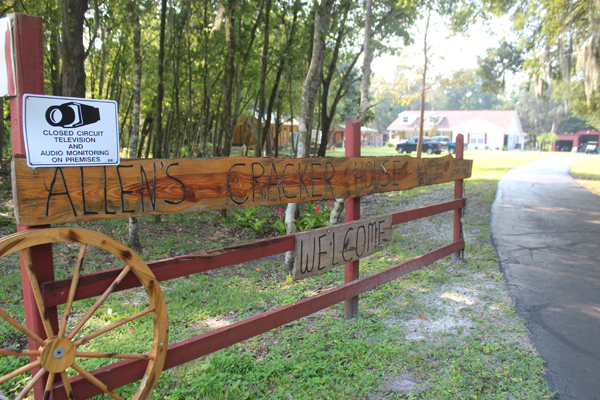 Simply drive down the road to Allen’s Cracker House, off of Lithia Pinecrest Rd in Lithia. After a year of constructing and renovating this project, which brings to life the time of his childhood, Billy Wayne Allen, born and raised in the area, is showing off his personal, backyard Cracker town which he built single-handedly. The project began in August of 2010 when neighbors of Allen’s, who work at the saw mill, offered him a pile of wood they were looking to get rid of. Allen accepted the load and many more afterwards, eventually deciding to build a Cracker House like the one he grew up in right down the road from where he lives now. “I’m not the kind that just sits around,” mentioned Allen, a God-fearing man in his late 60s. Allen has lived in the area since his birth in 1945 and has attended Lithia Church of God since the 1950s. 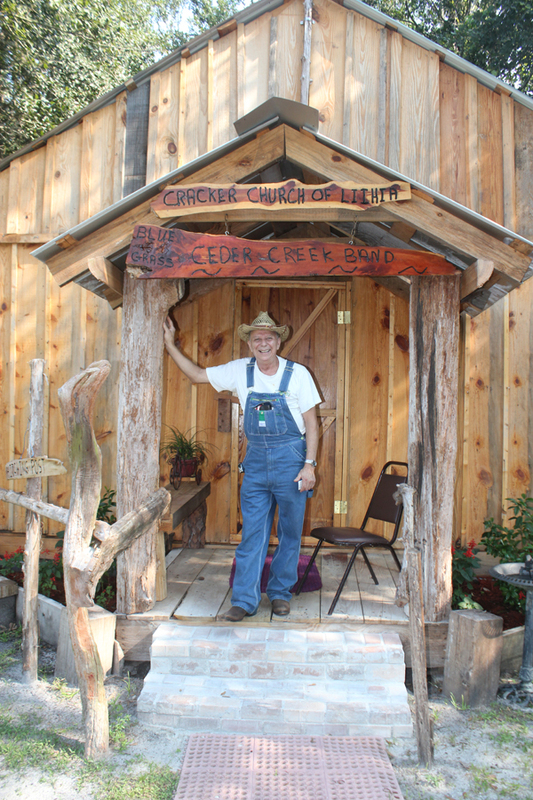 Billy Wayne Allen stands on the front porch of his Cracker Church of Lithia, which is to be dedicated at the end of October. The church was the third building constructed as part of his backyard cracker town. Allen’s Cracker Church of Lithia, which he has arranged to be dedicated at the end of October, is lined with articles and pictures of Elam Bryant, one of the first Lithia postmasters who delivered mail by horse for more than 40 years, and other Lithia residents who first moved there from across the Alafia River. It also houses Allen’s favorite piece of furniture, a 1908 piano which he purchased from a woman whose family it had been in for more than 100 years. Many people have suggested that Allen build a saloon to complete the cracker town, which he and his wife, Linda Sue Allen, are still considering. They would like additional input from the community on the suggestion. “We don’t know about it with the church and all,” Allen commented, but if he decides to construct it in the future it would be purely for show with no alcoholic beverages. For the time being though, Allen is happy to take a break from the project and enjoy with the community the fruits of his labor. Allen’s Cracker House, located at 19007 Dorman Rd., is a nonprofit organization which can be viewed online at allenscrackertownoflithia.com. To schedule a visit or comment on the future building of the saloon, e-mail Allen and Linda at allenscrackertown@yahoo.com.